I found this tiny baby scooting around in the ghost shrimp tank at my LFS. Poor thing was really scared, and I wanted to see what he is, so he's now living with me. If he gets too large or will be aggressive, I can rehome him. He's about 3/4 of an inch long, with vertical dark stripes that vanish if he's scared. He's very active and excitable, but he doesn't seem aggressive. That could change, of course, since he's just a baby. He's not a fussy eater, and he seems to prefer hanging out near the surface. He keeps trying (and failing) to eat the duckweed. Anyone know what he is? 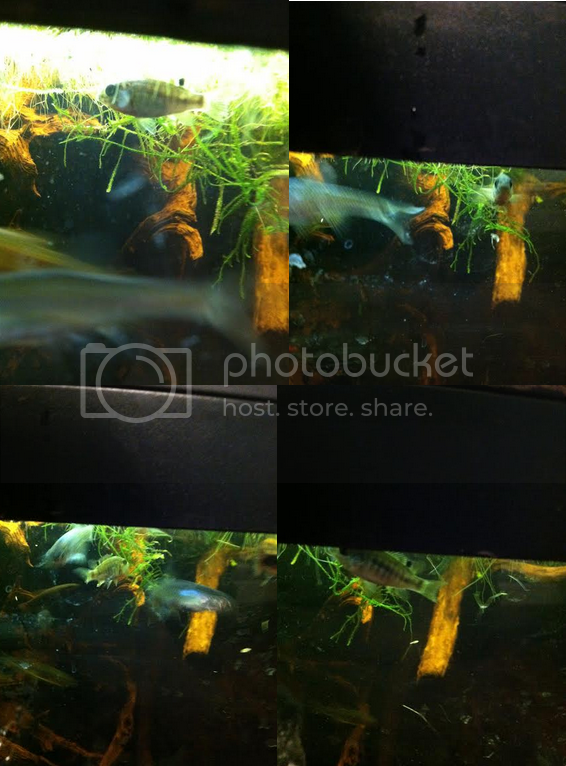 I know the picture isn't great, but we can't have that many native cichlids. I'm assuming he's native to somewhere in the US, because it doesn't make sense to import ghost shrimp. He didn't jump over from a different tank, because they keep their feeder tanks against a separate wall. He either came in with the ghost shrimp, or he came in with the rosy red minnows. Interestingly, their shipments of rosy reds have had a lot of unknown platy-like livebearers in them lately, so he might have been in there as well. I went and compared him to all the cichlids they have in stock, and he didn't quite match any of them. I'm about 97% sure he's a native of some brand, hence why I'm posting here. Is there any way you can make the picture bigger? I can barely make out the fish. As Dustin mentioned it is difficult to see, but based on what I can make out I would start comparing the fish to apistogramma images on line or in whatever reference book(s) you may have. Best of luck with the fish and its identification. Def not any species of Apistogramma. 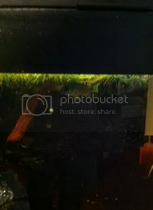 Picture is way too dark and even attempting to enlarge on desktop doesn't help give any idea of fish features. I'm afraid with this picture nobody is going to be able to positively ID. This is impossible. Please post a better photo. If you cannot, I can delete the thread for you. Like I said, there's no way it could have gotten over from one of their tropical tanks. The closest tropical tank is 6 feet away, and it's their monster fish tank, which has very few hiding places. No way a baby fish could have survived in there, let alone gotten over to the feeder tank area. Do these help? I'm sorry for the bad quality. He won't stay still, and if he's caught in something like a cup, he drops all his color and starts completely freaking out. I reduced the tannin level with a water change, so at least they aren't as dark. Edited by Betta132, 15 June 2015 - 09:52 PM. Thank you, at least we can see a fish now. It is a cichlid of some sort. Juvenile tilapia (Oreochromis) have that dorsal spot, and It would not surprise me if they happened to be in the same waters as grass shrimp, which are frequently from Florida. Not native whatever it is. If it is Oreochromis, it is going to get big real fast. I don't plan to eat something I've raised from a baby. I think I'll grow him just a bit more, see if he stays looking like a tilapia. If he does, I'll rehome him. Thanks for the ID! Never would have guessed that, all my guesses were considerably smaller fish.